The mantra of Reduce - Reuse - Recycle is one of the most common in environmentalism/sustainability. In other words, your primary responsibility to the environment and to the generations to come is to minimise your use of the world's resources (Reduce). An example of this is turning off the lights in rooms you aren't using. Where you cannot avoid using those resources in the first place, your secondary responsibility is to get maximum utility out of those resources (Reuse). For example, if you forget to take your reusable shopping bag to the supermarket and have to take a new bag, then reuse those shopping bags as bin liners. Reusing effectively reduces your need for replacements. Finally, where you cannot maximise the utility of those resources yourself, you should facilitate others to maximise their utility (Recycle). For example, you may not be able to make further use of your old coke bottles, but if they are correctly recycled then the plastic can be melted down or shredded to form new products made of plastic. Recycling is effectively passing on items to other people for them to reuse and can prevent materials from ending up in landfill (really just a big hole in the ground). All three have an effect of sustainability, since all three aim to ultimately minimise the need for raw materials, however they are ordered because not everything which can be reused can be recycled, and not everything can be recycled, so it is better to Reduce than Reuse and it is better to Reuse than to Recycle. You are right, the logo is not accurate. Rs chain one after another but they do not close the loop. The second (reuse) and third (recycle) are two loops in themselves. Imagine a glass cup. At first you Reduce (the top of hierarchy) - you do not buy any. Suddenly you need one. This means you cannot reduce anymore. You go to shop and buy one. You now started reusing the cup instead of reducing (avoiding) it. In reuse loop, no work is done, no materials wasted to produce a new cup. You just take and use existing one. Once you cannot reuse it (neither yourself or share with friends/neighbours/relatives) you Recycle it - pass it to the outer, larger loop. In this loop, the material rather the product is reused (and some energy is also saved when new good (of another shape) is produced since reusing materials is easier than mining the ores or processing a fresh wood for paper). So, the proper logo would look like as two loops, Reuse inside Recycle with the Reduce in the center. 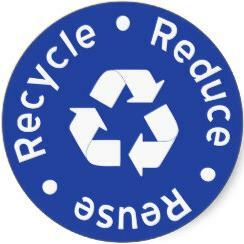 You are greener in the center when closer to the center and should never exceed the Recycle loop. It should read. Increase. In this way you have spent more in your local store. Helped the economy, increased jobs. Reuse what you can. This saves you money. Once used up put in the trash. Not yours to recycle. Once at the dump the dump pickers will remove all that can be recycled. This helps the poor. Keeps landfills from filling. Gives them some money to spend. This is under trickle down economics as the way to go. Not the answer you're looking for? Browse other questions tagged recycling reuse or ask your own question. Does the Reduce-Reuse-Recycle rule always apply?